We service Rolex, Omega, Patek Philippe, Cartier and most other fine watches. Bay Area Checkbook, a consumer magazine, rated us very highly in their watch repair study. We replace movements in many moderately priced watches. We can also replace watch batteries, watch bands, and can perform some minor repairs while you wait, such as new crystal, new stem, new crown, etc. 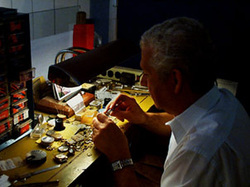 We also specialize in the "difficult to repair" jobs that other watch repair shops are unwilling or unable to do. We offer FREE jewelry cleaning, inspection and polishing. Let us check the condition of your set gemstones and bring the sparkle back at no charge! We can usually provide the service while you wait. Many minor repairs can be accomplished while you wait, or while you shop in the nearby stores. Major repairs are performed with expert care and experienced craftsmanship.